Our boat’s name has been in limbo until recently. We knew we wouldn’t keep the previous name, Lizzie. We also knew the name we chose would have to be approved by the national registration office, which requires that each Australian registered ship (or yacht in our case) has a unique name. So while we liked the name Dragonfly, we didn’t know for sure that we’d be able to have it, or a variation of it, until about a week ago. she has a name! Red Dragonfly. We were very excited to pick up our boat decal and official plaque a few days ago. 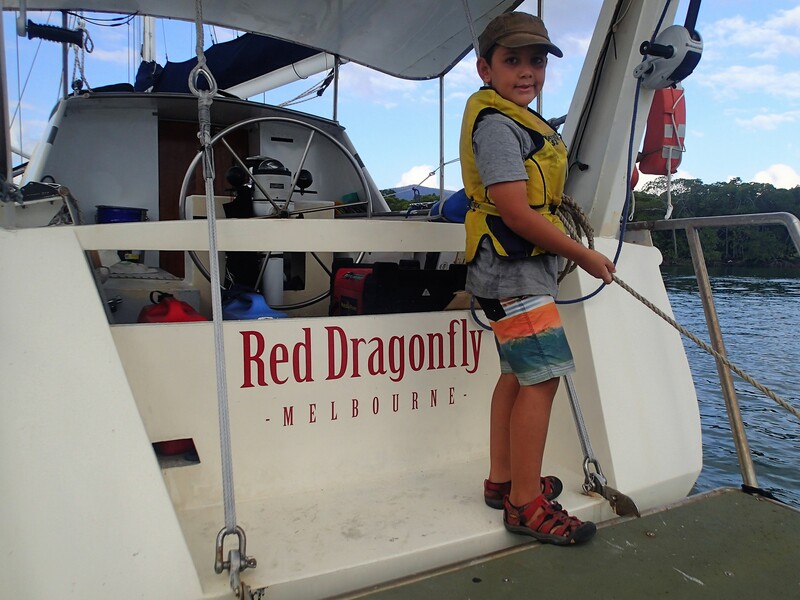 Simon started with the stern decal – it was the simplest to put on as he could kneel on the swimming platform. It went pretty smoothly so we decided to take the plunge and do the tricky ones. Simon hopped in the tender and pushed himself round to the side of the boat. While he floated there taking measurements and marking where it would go, Markito and I were up on deck getting the tools ready and tightening the ropes to steady the tender. Did I mention it was also getting dark? We had torches out too. It was a challenge, but as you can see, we got it on. We are super happy with the design. Thanks Mickey Ink Marine. 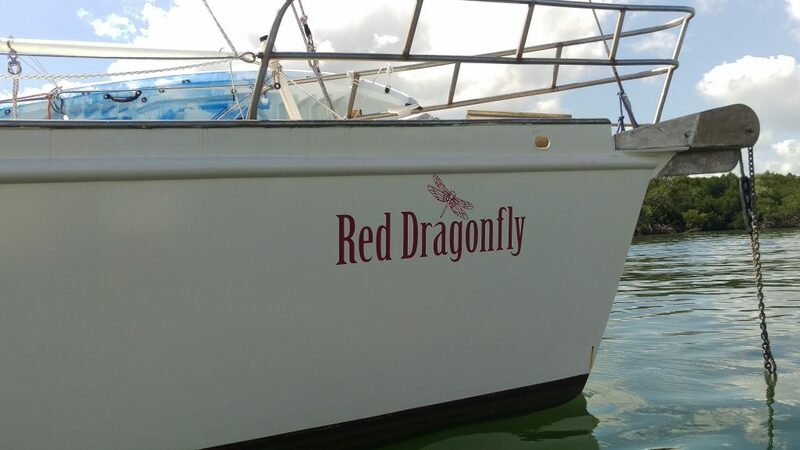 Red Dragonfly is a Radford 450 steel pilothouse cutter. The length is 45 foot or 13.7 metres, and she weighs 15 tonnes. There are three separate cabins, with the possibility of sleeping up to 7 people. This boat was designed by an Australian yacht designer, Graham Radford (http://www.radford-yacht.com/dsn013/dsn013.html), and was built in Tasmania. It’s currently rigged as a cutter, with three sails that we use frequently – a mainsail, staysail and yankee – and a spinnaker that we use in light winds. On average she goes around 7 knots. Red Dragonfly holds 1,000 litres of water and 750 litres of diesel fuel. We love the 150hp engine. It’s about twice as big as it needs to be for this size boat, so it usually doesn’t need to work very hard, but when we really need it, it gets the job done. 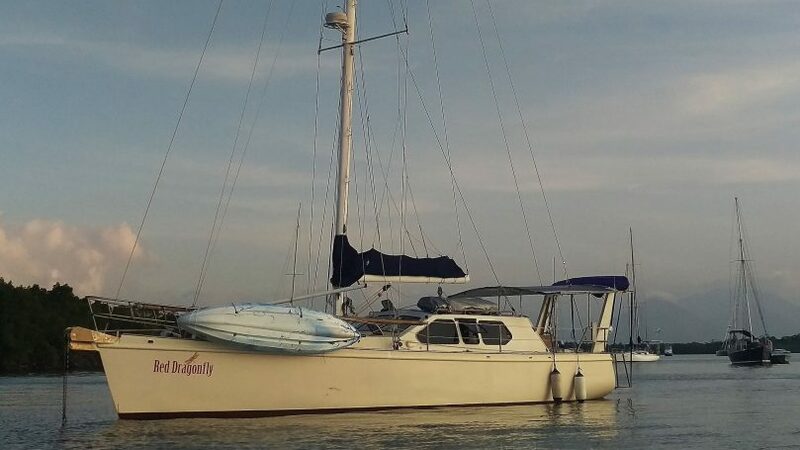 She has a fully equipped galley with an induction stove top, a convection oven/microwave, a sink with salt water and fresh water taps, a fridge and freezer, a slow cooker/rice cooker, ice maker, blender, and most of the standard cutlery, crockery and cookware you would find in a house. We don’t have any gas on our boat, we do all our cooking using electricity. There are three main sources of electricity: a 500watt solar system, a 5kw backup generator and the engine. We also have the option of staying in a marina where we can plug into their electricity, although we rarely do this. There is a separate toilet, as well as a shower in the bathroom that you can stand up or sit down in (when the ocean is rough). It has an instantaneous electric hot water system connected to it. A real treat! We also have an apartment-sized washing machine. Another luxury that makes life on board a little easier. In the coming months we’re going to do some more technical posts about the boat and how she sails, so keep an eye out for those if you’re after more detail.